It’s been a year since the introduction of Velib’, Paris’s bike rental system and they are being used by people all over Paris! The Velib’ program was conceived by the Socialist mayor, Bertrand Delanoë, and the 10-year contract was won by JCDecaux, a major French public relations advertising company. Paris has about 20,600 bicycles in service, with more than 1,450 self-service rental stations, (four times as many as there are subway stations)! The bikes are cheap to rent because they are funded by advertising. In Velib’s first year, there were roughly 27.5 million trips, (on the bike), in a city of about 2.1 million people. Many of the people used the bikes for daily commutes. On average, there are about 120,000 trips a day on the bikes. That’s a lot! There is now a Velib’ web site and a Velib’ Magazine. Some postings discuss the best way to ride with a skirt, best place to rent a bike during the morning rush, and many other interesting posts. It’s hard to gauge how many trips by car, or taxi are avoided with use of the bikes, but the eco-friendly nature of the Velib’ bikes has been heavily promoted in Paris in the hope of shedding light on the effects “eco” changes can have on our fragile planet. Although most Parisians have embraced the Valib’ bikes, there are still those people who are compelled towards vandalism and theft. There have been about 3,000 bikes stolen, 15% of the total. 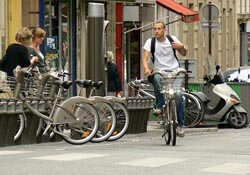 Due to the success of Velib’, major cities, including American ones, are exploring similar projects. Let’s hope Velib’ makes its way to a city near you!